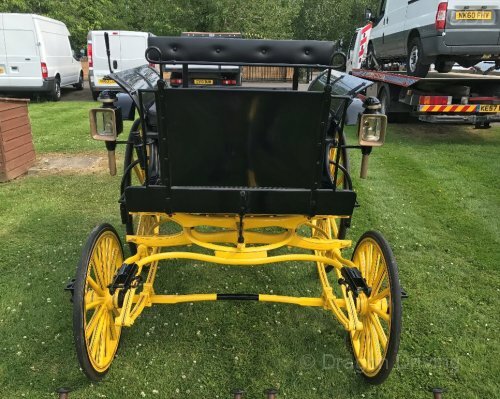 Rivington presentation vehicle to suit 14.2hh to 16hh in ex condition. Lovely vehicle to drive and extremely smart dark shade of blue. 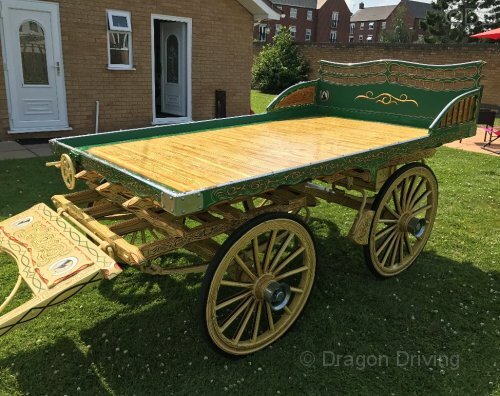 For sale, the original Katie Price Cinderella carriage. This comes complete with its own website. Only for sale as I have a new one on order. Wagonette, seats 6, made by Huhnite Hutschen (German), runs extremely well. This has done many weddings. Comes with pole for a pair and two sets of shafts. Cob size and heavy horse (Clydesdale/Shire). 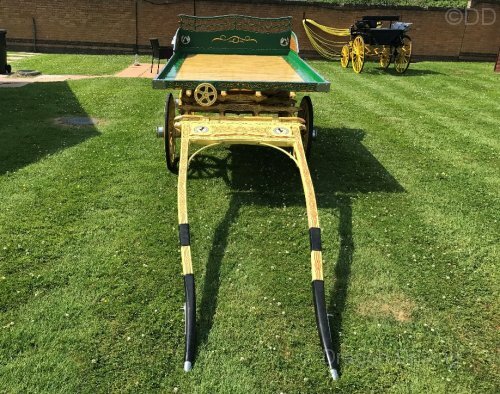 H&M sporting carriage, this carriage had been custom made, for a team of standard Shetlands. It comes with single shafts, pair pole and team bar. Even a basket you can attach to the back to seat dogs in! Lovely four wheel carriage that needs some TLC just cosmetics. 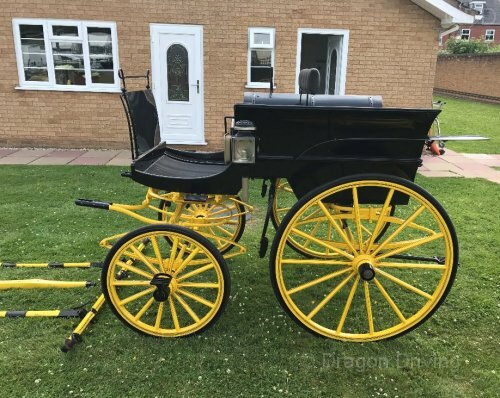 Victoria carriage, original but restored by me for our daughter's wedding. Hubs say Jensen Hoyer. All repainted with high quality coach enamel. Reupholstered passenger seating with new vinyl on shafts. New rubber flooring. Complete with basket at rear for flowers, wedge and flat cushion for whip and lamps. All works, the trip away from the church was a hilly 6 miles. The wheels could do with a little more attention but they are very serviceable. The horse in the picture is 14.3hh, he is chunky and pulled it fine. There is a fitting on the turntable for a pole so it could be pulled by a pair but you'd have to get a pole made. Ideal for weddings, proms or similar. 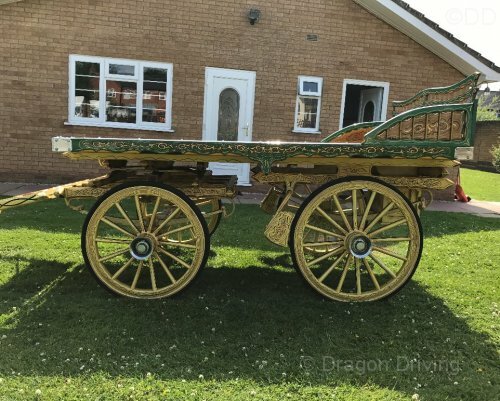 Might consider swap +/- cash for good condition show wagon to suit 15hh Hackney. Four wheeler rally cart, Auxiliary. C.S. Ltd, London on the wheel hubs. Front & rear bench seat, leather upholstery. This vehicle belonged to my grandfather, been in our family for 60 plus years. Genuine enquiries & no withheld numbers please. 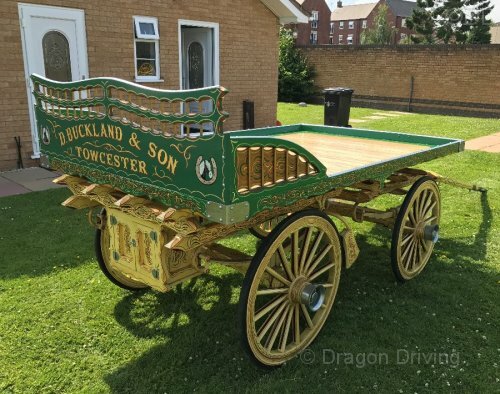 Four wheel Wasall trolley fitted with rubber tyres, built by Walsall coach builders ltd. In excellent condition, owned by myself for over 30 years. Genuine enquiries only & no withheld numbers please. Immediately ready for work, used for promotion work and weddings. 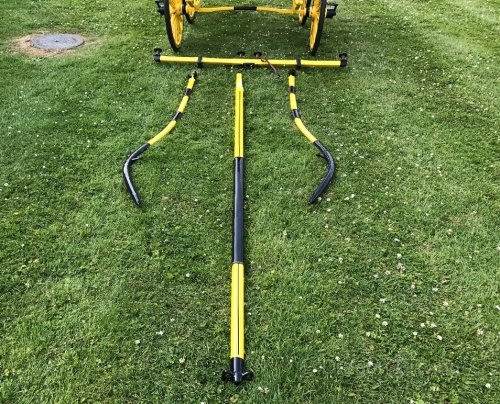 Single adjustable shafts, we can provide pole for pair driving. Front and rear brakes, parking brakes, indicator lights, inside lights, rear and front lights. Rear platform for prams and travelling case. 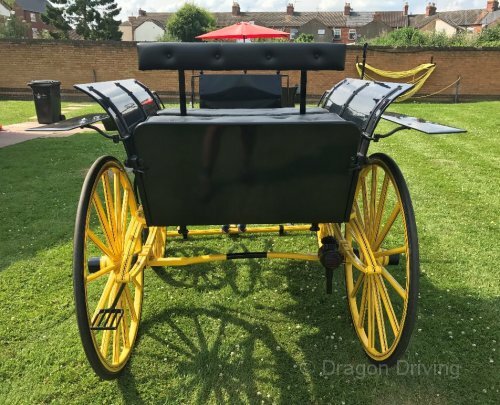 Victoria wedding carriage, immaculate condition, suit 13hh - 15.2hh. Steel wheels with rubber treads. Good seating, raised drivers seat, handbrake. Easy access for passengers. Ready to go to immediate use. Please ring Doug for more details and pictures. Bennington Fun Bug GL, immaculate condition. Quick release clips, removable back step, dash spare parts bag & manual. .